In North Carolina and other states, extreme anti-LGBT legislatures are mounting unprecedented attacks on LGBT people. We will not sit idly by while our communities are under attack. We need your help! Elected leaders in San Francisco, Seattle, Chicago, Boston, West Palm Beach, and the states of New York, Washington, and Vermont have issued executive orders banning taxpayer-funded travel to North Carolina in the wake of passage of the vile anti-LGBT law. Let’s keep that momentum going!! We urge each of you to participate in our #WeAreAllNC campaign now. 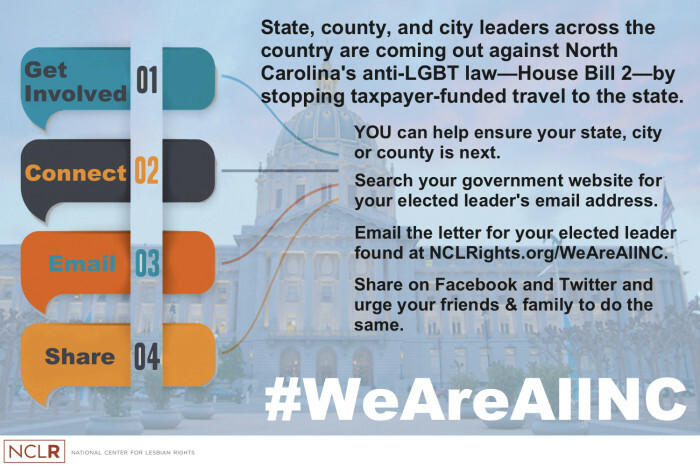 #WeAreAllNC recognizes that no matter where you live, you can press your local officials or Governor to stand on the just side of history by emailing them directly and sending sample language to adopt similar bans. CONNECT—How to search for your elected official’s email address. EMAIL—A letter and ban language to your elected leader asking to join the effort. SHARE—Pre-populated social networking posts and tweets. STATE LEADER—Use this search function to find your governor’s email address or message page. CITY LEADER—Use this search function to find your mayor’s email address. If your city is not in listed, search your city government’s website for the “mayor’s office” or “city council” page, where you should find a link to your mayor’s bio and contact page. COUNTY LEADER: If you reside in an unincorporated area of your county, search your county government’s website for the page describing the county’s governing board or council, where you should find a link to the chairperson’s bio and contact page. Cut and paste the below letter into an email or message page for your elected leader. You may have read about the recent law—House Bill 2—in North Carolina that is deeply harmful and stigmatizing to the LGBT community and to others targeted for discrimination. I am hoping you will take a courageous and honorable stand against this injustice. I am a citizen of <fill in city or town name and state>. I am writing to encourage you to follow the lead of a number of other elected officials in denouncing this law by enacting a travel ban for city employees traveling to North Carolina using taxpayer dollars. Several cities and even the entire state of New York have enacted similar ban. I am including a link—www.NCLRights.org/NCSamples—for you to download sample language for such a ban. Thank you for your leadership and consideration. I deeply hope my <fill in either city, county, or state> will be on the right side of history. After you have emailed your elected leader, share what you have done across your social media platforms and encourage your friends and family to do the same. CONNECT: How to search for your elected leader’s email address. EMAIL: A letter and ban language to send to your elected leader asking to join the effort. SHARE: Pre-populated social post and tweet. Are you a transgender student or a parent of a transgender student? Read this fact sheet and learn about your rights in North Carolina. Elected leaders can download sample executive order language and examples from other executive leaders. For more information on how to repeal House Bill 2, contact Equality North Carolina.